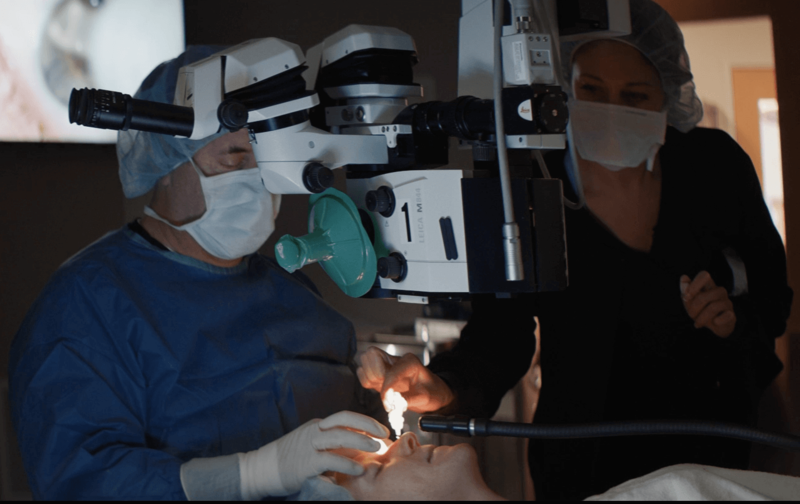 The surgeons at Vance Thompson Vision are committed to creating a comfortable and enjoyable surgical experience for patients, which they do so through a number of surgical habits. Dr. Thompson enjoys connecting with all of his patients, greeting them and continuing the relationship they began in the clinic. Dr. Berdahl says he always remembers to say good morning to everyone before he begins working and to say thank you at the end. “Performing surgery on a fellow human is an intimate act, and it deserves the respect implied by basic human communications and interactions,” Dr. Thompson says. Dr. Alison Tendler uses art to brighten the day of her patients. Surgeons mark the operative site of their patient, and while most people write their initials, Dr. Tendler makes small drawings depending on the time of year, such as a decorated tree, a snowman, or a shamrock. “Each season or month holds a new piece of art to be discovered and used to hopefully brighten someone’s day,” Dr. Tendler says. Music is also an important ritual for Vance Thompson Vision’s surgeons, for it relaxes the patient and the surgical team. Dr. Thompson listens to primarily romantic or contemporary piano music in the operating room, while Dr. Tendler, Dr. Berdahl, and Dr. Greenwood play a variety of musical styles during surgery. During the Christmas season, Dr. Tendler insists on listening to some form of Christmas music. Dr. Berdahl plays his music a little louder than his surgery technician Ronda likes it and enjoys singing along with the music for his patients. Sometimes, they even join him. Being in the operating room requires a high level of concentration, so the surgeons do all they can to ensure a smooth surgical experience. On her long surgery days, Dr. Alison Tendler eats a special shake for breakfast that sustains her throughout the morning. She loves hats, so she enjoys choosing one of her colored scrub hats with flowers to wear for the day, and then her staff matches her magnifying glasses to the color of her scrub hat. A good night sleep before his surgeries is vital to Dr. Berdahl. Dr. Greenwood uses consistency and gives clear directions to his assistants, which allows them to work at their peak and provide comfort for his patients. The surgeons at Vance Thompson Vision value having easy access to patient information so they can be highly prepared for each procedure. They review all the procedure and patient information and post it prominently in the operating room. Through their daily habits, the doctors at Vance Thompson Vision work hard to create a relaxing atmosphere for their patients so they can achieve the best visual results.